The Erich Dieckmann tube chair development illustration has been doing-the-rounds of late, and it’s quite a interesting—at least to me—look into the design process way-back-then. It’s really way-back given Mr Dieckmann was born in 1986, and passed 1944. Seems this particular illustration is from a rare book, titled: Erich Dieckmann – Möbelbau in Holz, Rohr und Stahl, which you can buy from Amazon for a thrifty £150. More on the Bauhaus-Movement: architects and designers. Erich Dieckmann (1896-1944) studied architecture at Danzig Polytechnic from 1918 until 1920. After finishing the foundation course, however, he dropped out and went to Dresden, where he began to study painting and drawing. In 1921 he enrolled at the Bauhaus in Weimar. Between 1921 and 1925 Dieckmann served an apprenticeship there as a carpenter. When the Bauhaus school moved to Dessau in 1925, he transferred to the Staatliche Bauhochschule in Weimar and was head of the carpentry workshop there from 1925 until 1930. From 1939 he lived in Berlin. Erich Dieckmann was one of the most important furniture designers at the Bauhaus, developing type ranges for seat furniture. 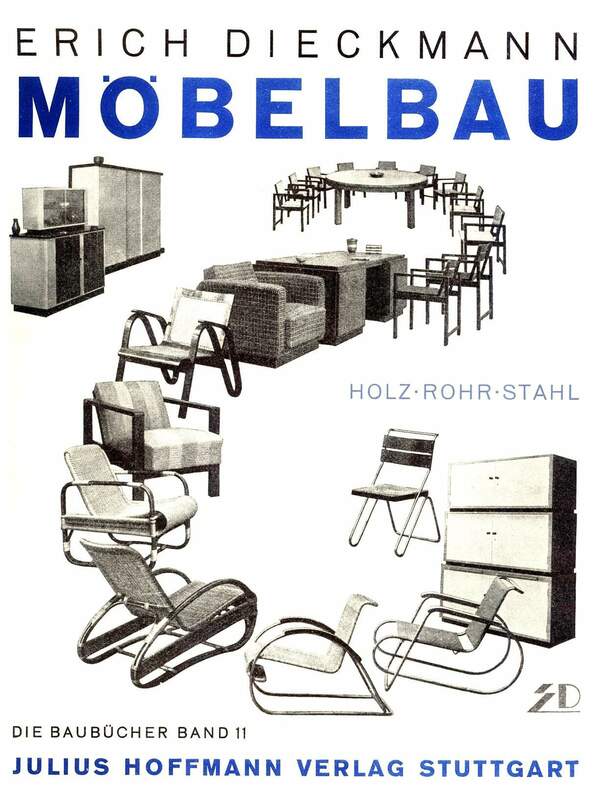 Like Marcel Breuer, Erich Dieckmann experimented with steel tubing but is primarily known for his standardized wooden furniture. Dieckmann’s designs for seat furniture are stringently geometric, with frames based on right angles and constructed of almost pieces of wood that were either almost square in cross section or flat; another feature typical of Dieckmann’s work is linking armrests and chair legs in a runner construction.